The success of the Canadian healthcare system relies on the effective sharing of information. When healthcare professionals share information well, they work better together resulting in better outcomes for all Canadians. The most effective logos express the essential idea behind an organisation. The Canadian Nurses Foundation brand expresses the important work that nurses do for all Canadians. 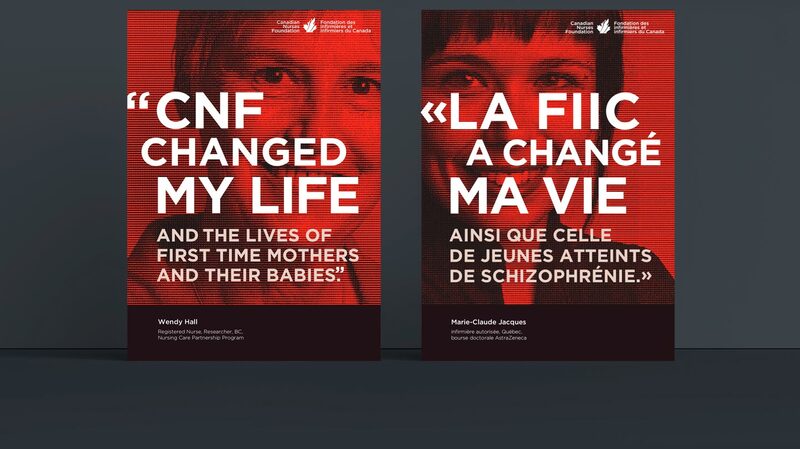 The Canadian Nurses Foundation logo, website and video celebrate nurses and the diverse forms their important work takes. A well designed logo succinctly expresses the story behind an organisation. Logo design is a multi-faceted process including concept, design, typography and often illustration. It’s a process of continuous refinement that blends the client and designers’ perspectives. Eloquent logo visuals express only essential messages. The grey portion of the maple leaf represents the CNF’s investment in research. The vibrant red portion of the maple leaf is morphing into a flame. The flame references the tradition of nursing personified by Florence Nightingale’s lamp. The flame also depicts how the CNF bears the touch and light of scholarship and education for nurses across Canada. The dark red portion of the maple leaf is a direct symbol for the CNF’s commitment to Canadians. Once a brand is well established and applied to multiple elements it amplifies. The ROI is a result of each of the parts reinforcing the others. Not many Canadians understand how diverse the nursing profession can be (Canadian nurses included). The Canadian Nurses Foundation logo, website and video celebrated nurses and the diverse forms their important work takes. Fifty also worked on a 150th anniversary project that served as a promotional campaign for health sciences students to consider a career in nursing. Despite what people think, nurses practice on the street, in clinics, in homes and in the classroom. The CNF video tells that story. To tell the full CNF story, Fifty filmed hard-working nurses in 8-10 different locations across the city. Is your healthcare message well-received by healthcare audiences?